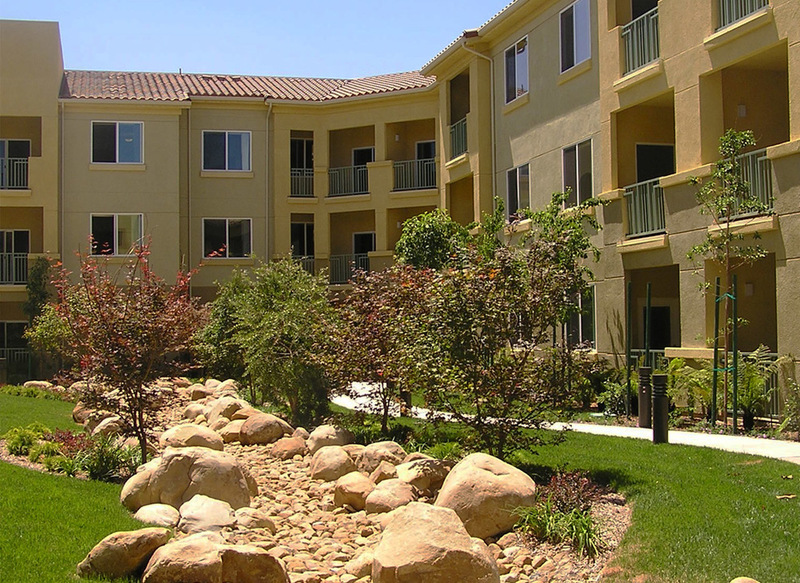 TESORO SENIOR APARTMENTS — Pacific Coast Land Design, Inc.
Tesoro Senior Apartments is a 450 unit complex within San Fernando Valley’s Porter Ranch residential community. The buildings are configured to create four large courtyards. 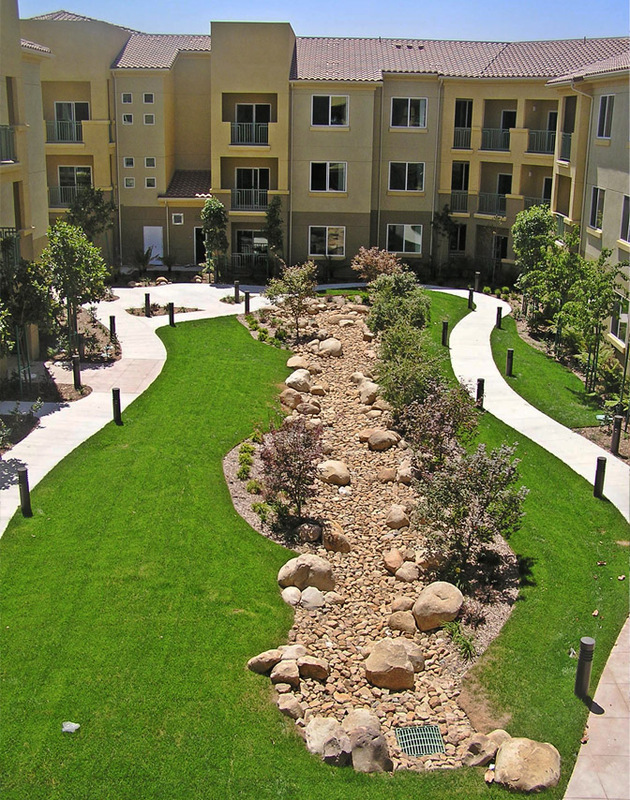 Each courtyard has a unique character that offers residents a variety of outdoor activities. Rose gardens, alcoves of various sizes, a creek bed with boulders for seating and shaded patios provide a quality outdoor living environment. The landscape is well lit. Walks are wide, curving and low sloping. The landscape has special paving to designate buildings entries and outdoor seating along the walking paths. The recreation area features a large community room. The pool deck has a sweeping shade cover and a 20 yard lap pool with adjoining water play. It is also equipped with a spa and a group barbeque area. Landscape planting was organized to maximize privacy and courtyard open space. Preliminary Design and construction documents consisted of hardscape and landscape for the entire site. Appurtenant design features included subsurface drainage, security walls, perimeter fencing, shade structures and fences, street monumentation and landscape lighting. Recreation facility design included the pool, spa, hardscape, shade structure and walls and fences that met accessibility and safety codes. Construction administration included hardscape and landscape installation. traction. Weather based controller & water conserving plants that met state mandated water conservation requirements.